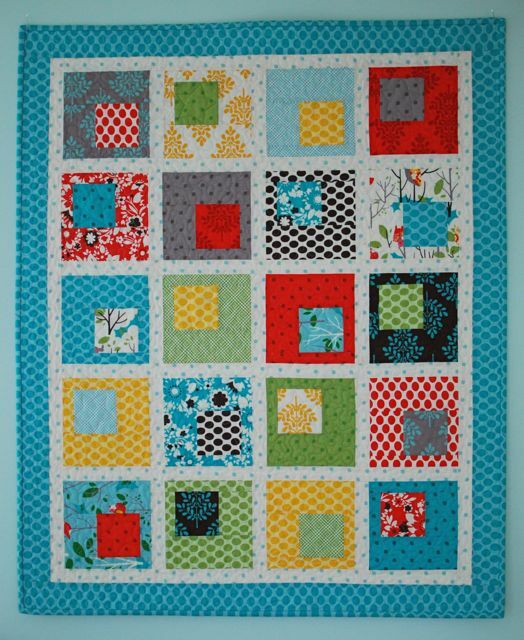 Looking for a quick and easy baby quilt? This goes together in no time and uses just 20 Layer Cake squares. That means with some extra sashing and border fabric, you can make two! Know anyone having twins? I used “It’s A Hoot;” such a fun and colorful line. Choose 20 of the 10″ Layer Cake squares for the blocks. Pair up the squares into 10 sets that look good together. 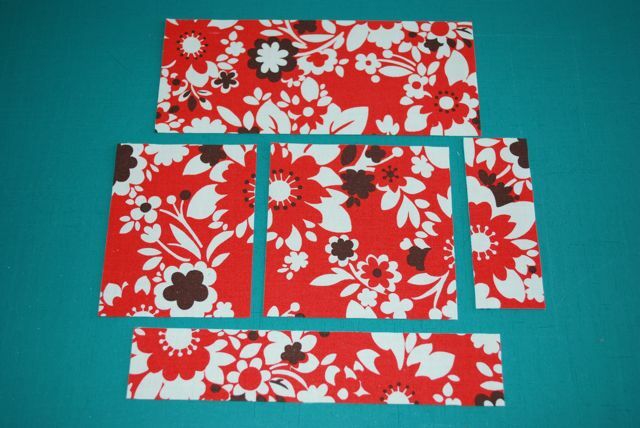 In each set, one fabric will be the center square and the other will be the outside of the block and vice versa. Move the center square to the bottom and you’re ready for piecing! From the Marshmallow for the sashing, cut 11 strips 1 1/2″. 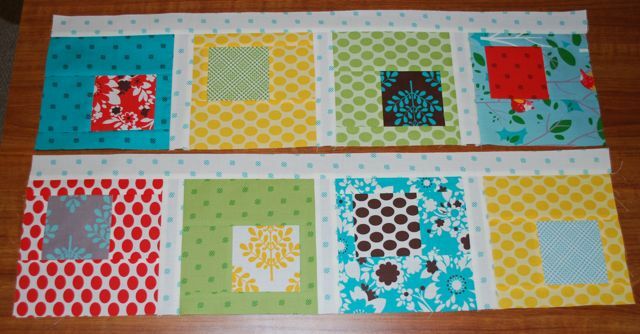 From the Turquoise, cut 4 strips 2 1/2″ for the border and 4 strips 2 1/2″ for the binding. 1. 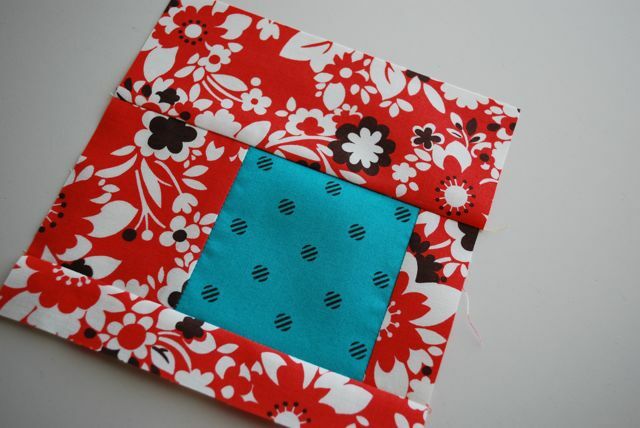 Sew the 2 3/4″ x 3 1/2″ and the 1 1/4″ x 3 1/2″ pieces to the 3 1/2″ center square. 2. Sew the 2 3/4″ x 6 1/2″ and the 1 1/4″ x 6 1/2″ pieces to the top and bottom. Make a total of 20 blocks. 3. Layout the blocks in 5 rows of 4 blocks each. Refer to the finished quilt and turn the blocks so that the center square alternates its position between the lower right corner and the upper left corner. Sew 4 blocks together in rows with the 1 1/2″ x 6 1/2″ sashing strips in between. 4. Sew the rows together with the 1 1/2″ x 27 1/2″ sashing strips in between and on the top and bottom. 5. Sew the 1 1/2″ x 36 1/2″ strips to the sides. 6. 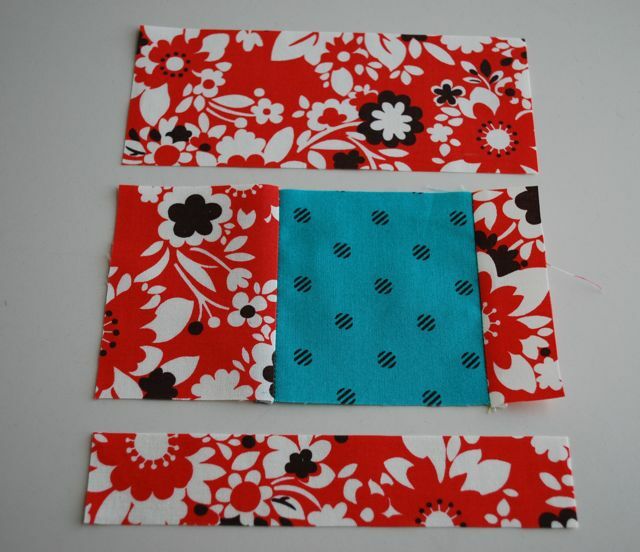 Trim the 2 1/2″ Turquoise strips to length for the side borders and sew to the sides of the quilt. Repeat with the top and bottom borders. 7. Layer the quilt top with the batting and backing. 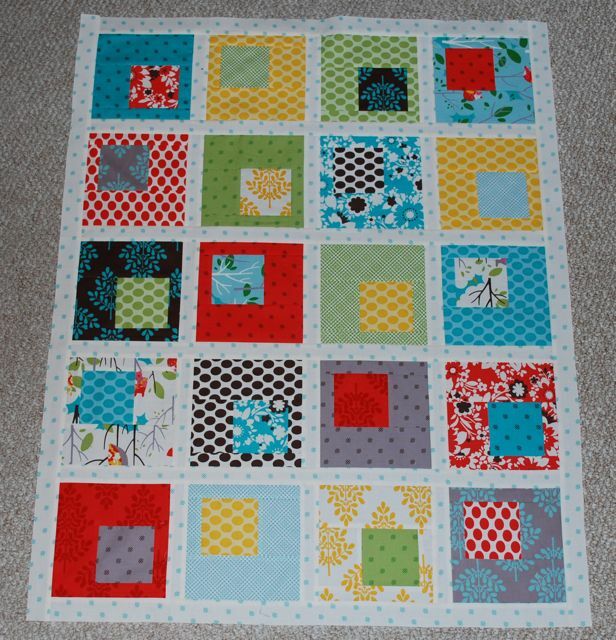 If machine quilting is new to you, here’s a tip on creating a custom look with simple quilting. 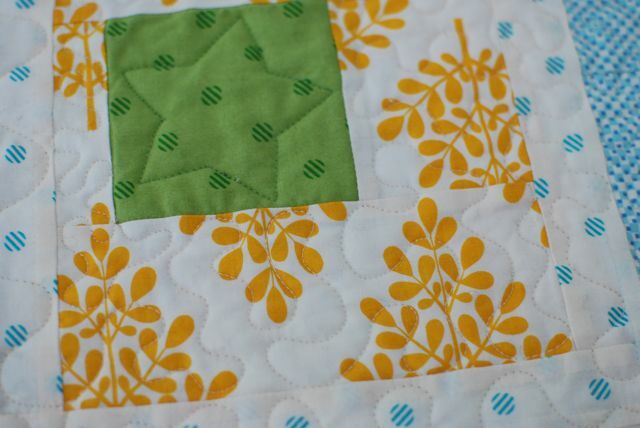 Use any simple quilting design, but change thread colors as you move to different colors in the quilt. I did a simple star motif in the center squares and stippled the entire remainder of the quilt, stopping to change thread color as I went. 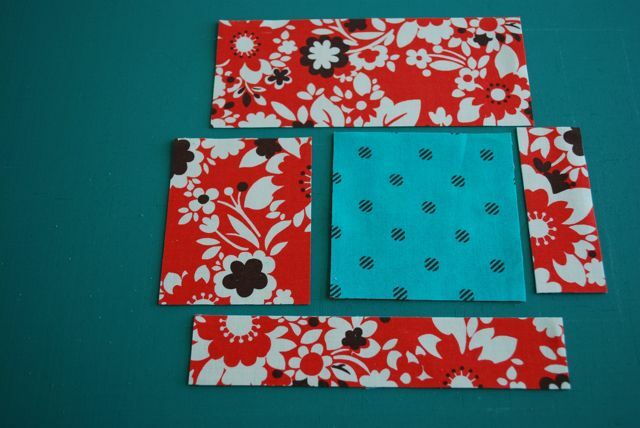 After quilting, bind with the 2 1/2″ Turquoise strips. 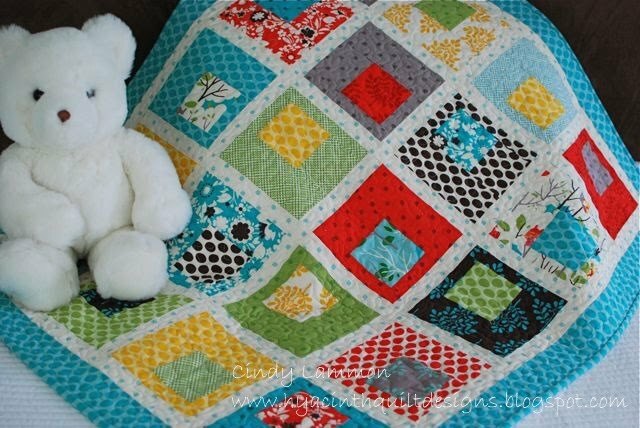 A simple baby quilt to snuggle under! 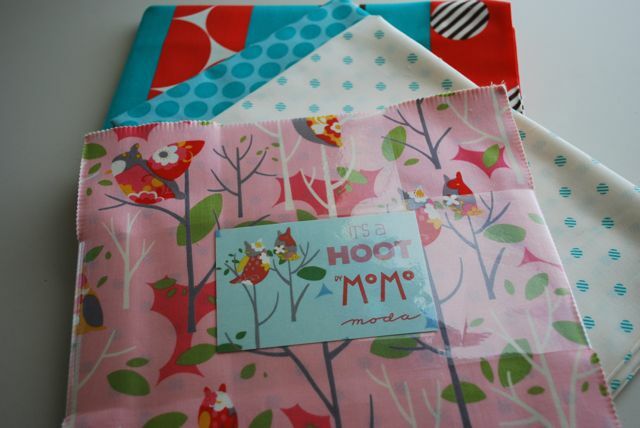 This entry was posted in Baby and Kids, Easy, Layer Cake, Quilt and tagged It's a Hoot, MoMo.